"Northern Germany was rich in megalithic monuments at the beginning of the nineteenth century, but now they have vanished. In every civilized country societies were founded in the nineteenth century to stem the tide of destruction that swept away monuments of the past with the increase of population, the opening of new lands to cultivation by new methods, the ceaseless depredations of treasure and souvenir hunters. But the antiquities went right on disappearing. [Carl Schuchardt, Alteuropa (Berlin: De Grunter, 1935)] "
The Bible lacks archaeological support for many of its claims. This has not prevented Bible maps from featuring "the traditional route of the Exodus", or "Mt. Sinai", neither of which are agreed upon by religious and secular authorities. We should recognize that the northern American setting of the Book of Mormon, deserves to be mapped. A map should be based chiefly on scripture. LDS scripture and the statements of Joseph Smith, show that at least some lands of the Book of Mormon are in the neighborhood of Lake Erie, Lake Ontario and the Finger Lakes (Cumorah in its land of many waters). 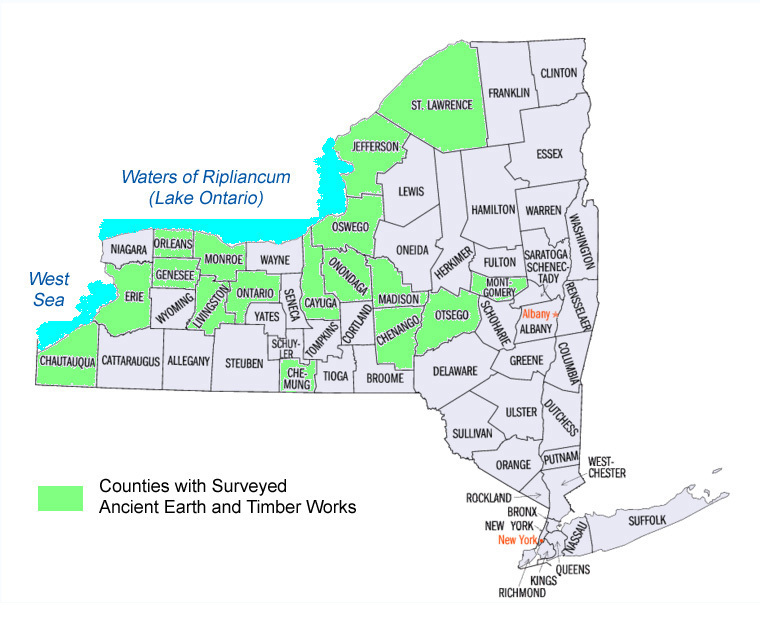 The emphasis placed here on LDS scripture and verifiable statements of Joseph Smith should not be taken to mean that archaeological correlations have never been found in the region of the Finger Lakes. Prior to their demolition, the remains of numerous earth and timber fortresses could be found throughout the counties of New York State. Ephraim George Squier, commissioned by the Smithsonian Institution, documented this fact. 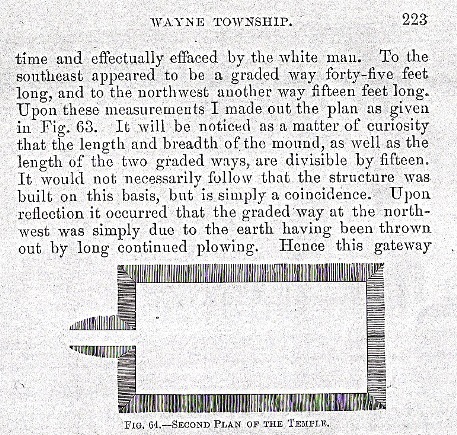 "By whom were the aboriginal monuments of Western New York erected, and to what era may they be ascribed? The consideration of these questions has given rise to a vast amount of speculation... 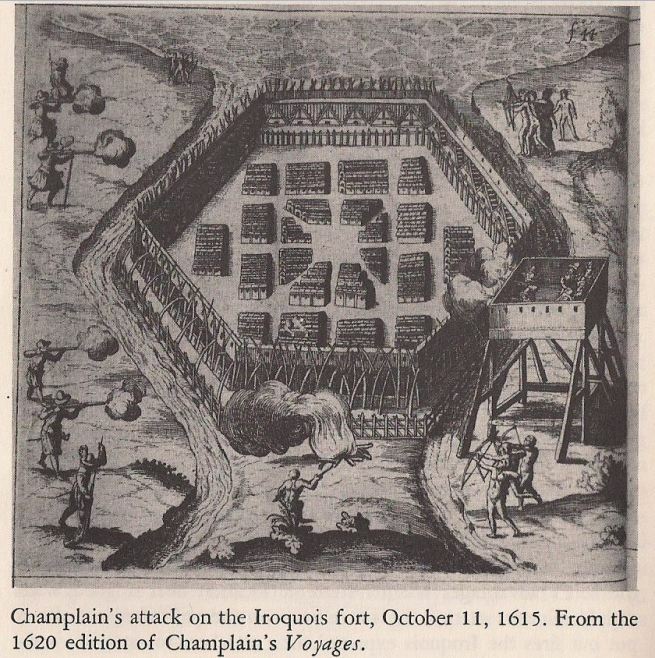 If the results arrived at have been erroneous, unsatisfactory, or extravagant, it may be ascribed to the circumstance that the facts heretofore collected have been too few in number and too poorly authenticated to admit of correct conclusions..."
Certainly some of the fortifications Squier visited were constructed in more recent centuries. Evidently native peoples of New York continued to build earth and timber fortresses long after Book of Mormon times. Their entrenchments, banks of earth and timber palisades are a far better match for the constructions described in the Book of Mormon than any of the stupendous stone buildings found in Central and South America. The great Chichen Itza temple-pyramid of Kukulcan features in the background of the popular LDS painting "Christ in America", and the "The TESTAMENTS". The scene may be interpreted to depict a visit by Kukulcan to the people of the Yucatan in the 11th century AD or later, but a scene from the Book of Mormon, it most certainly is not! 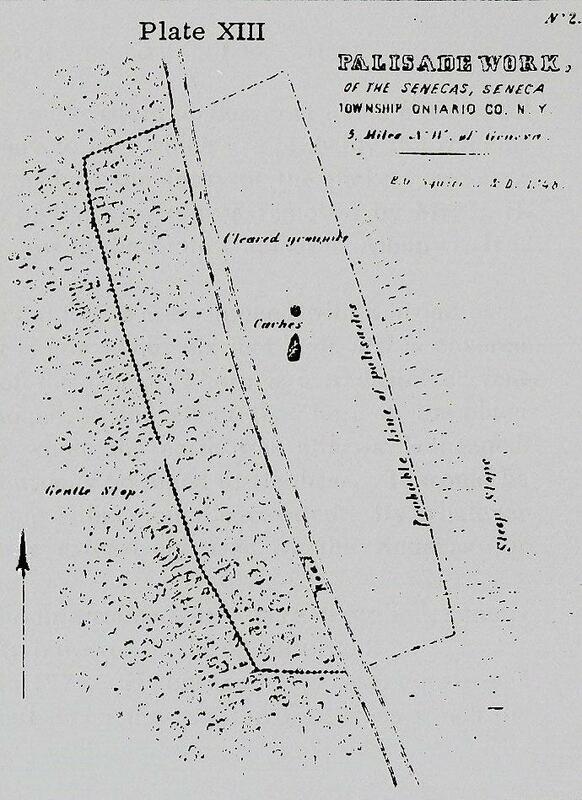 Squier surveyed works which enclosed areas ranging from less than an acre to over twenty acres. He notes burial pits and mounds containing numerous human skeletons. He mentions artifacts of silver, copper and brass found at various New York sites. The Central American Pyramid of Kukulcan, built between the 9th and 12th Centuries A.D. Even with the recent discovery of a 10th century B.C. wall at Jerusalem, there is still little archaeological proof that Solomon’s Temple existed. On the other hand, similar temples have been found throughout the Levant (the eastern Mediterranean region). The physical similarity between these temples and the one built by Solomon described in the Bible, does not mean the GOD of Israel was worshiped at these sites. No Central or South American edifice or temple complex holds a menorah to the Solomonic similarities of the pagan ‘Ain Dara temple. What can be said then for alleged parallels between Solomon’s temple and the temple complex at Izapa Mexico? (Michael De Groote, “Hebrew design in Mesoamerica: Temples match”, Mormon Times, October 2009) No single building at this Central American complex matches Solomon’s temple. If you cleverly size and impose make-believe rectangles on a whole layout of buildings, clipping and cutting through a building here and there, you may convince yourself that part of the complex fits proportions (certainly not the size) of Solomon’s temple. What is this supposed to prove? That Israel’s God was worshipped at Izapa? That the temple complex was built by Hebrews? That Book of Mormon real-estate lies in southern Mexico? None of these notions fit the facts. Israelite temple proportions are three dimensional, not just 2-D. This fact alone tends to flatten the whole claim. The peoples of Izapa predate the Nephites of the Book of Mormon. The temple of Solomon and the earlier Tabernacle of the Congregation incorporated architectural elements found in other cultures, i.e. Egyptian and Phoenician. So even if an architectural analog to Solomon's temple could be found in Mesoamerica or even in temperate North America, it wouldn't prove an Israelite connection. But, what about sacred ratios? How impressed should we be with the proposition that some architectural ratios at the Izapa complex match Israelite temples? The sequence 0, 1, 1, 2, 3, 5, 8, 13, 21…, in which each number is the sum of the previous two, is called the Fibonacci sequence. Ratios of these numbers can be found in nature, art and architecture. One special ratio resulting from Fibonacci numbers is called “the Divine Proportion” or “the Golden Ratio”. The ratio of a Fibonacci number to the one just before it in the sequence is approximately the Golden Ratio. As the ratio is taken of greater and greater Fibonacci numbers the result gets closer and closer to the Golden Ratio (about 1.618). The ratio of the breadth of Noah’s Ark to its height is approximately the Golden Ratio. (Genesis 6:15) The ratio of the length of the Ark of the Covenant to its width or to its height is approximately the Golden Ratio. (Exodus 25:10, 17) The same is true for the ratio of any side of the Levitical altar to its height. (Exodus 27:1) Does this mean that everything in nature, art and architecture that approximates the Golden Ratio ties back to ancient Hebrew culture? Of course not! No more than the ratios of other Fibonacci numbers present in the architecture of Solomon’s Temple, e.g. 1:1, 2:1, 3:1, 3:2 etc. Izapa complex proportions are therefore not uniquely Hebraic. The Mesoamerican stone ruins fixation; draws from the influence of John Lloyd Stephens’ bestseller, Incidents of Travel in Central America, Chiapas and Yucatan; published more than a decade after the Book of Mormon.